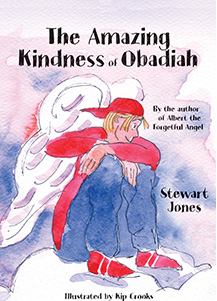 St Martin in the Bull Ring » The Amazing Kindness of Obadiah – New book by Stewart Jones! Excited Obadiah passes his overseer exams and is now able to do everything an angel is gifted to do. But he misunderstands these gifts and has a hard lesson to learn in how to use them. Amazingly, he does this, and God Almighty is so impressed that Obadiah is chosen to take one of the most important messages ever to earth. But he doesn’t do the task in the expected way, and so discovers something about himself and God’s plan. This story is the prequel to ‘Albert the forgetful Angel’ and tells the story of how Obadiah became the kind overseer of that book. Oh and look out for Albert in this book too! To find out more, order an e-book version of this book or to buy Albert the Forgetful Angel visit St Martin’or www.stewartjonesbooks.co.uk. This book is written by the Rector of St. Martin’s, Stewart Jones and the sale of the books goes to support the work that the church does for the vulnerable.